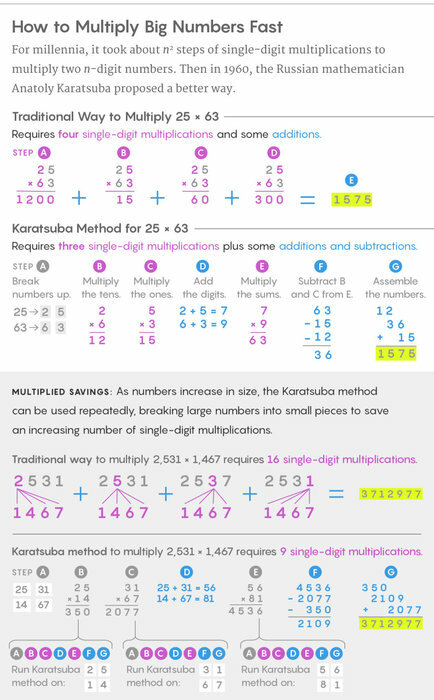 For millennia it was widely assumed that there was no faster way to multiply. Then in 1960, the 23-year-old Russian mathematician Anatoly Karatsuba took a seminar led by Andrey Kolmogorov, one of the great mathematicians of the 20th century. 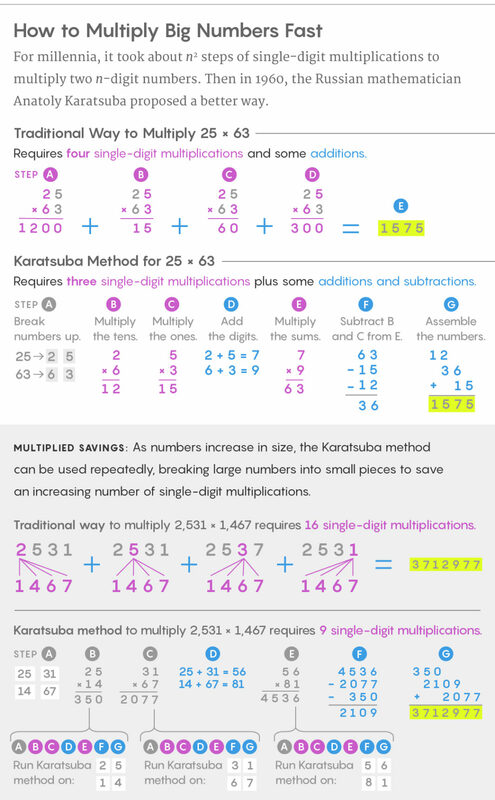 Kolmogorov asserted that there was no general procedure for doing multiplication that required fewer than n2 steps. Karatsuba thought there was — and after a week of searching, he found it. Second, in that same paper Schönhage and Strassen conjectured that there should be an even faster algorithm than the one they found — a method that needs only n × log n single-digit operations — and that such an algorithm would be the fastest possible. Their conjecture was based on a hunch that an operation as fundamental as multiplication must have a limit more elegant than n × log n × log(log n). Tu as essayé 87 x 79 ? 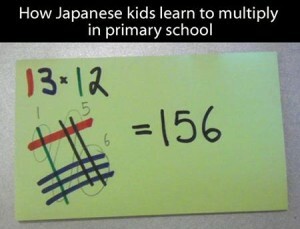 Sinon, j’aime bien la « multiplication croisée ». Apparemment, on met plusieurs méthodes sous ce nom (et celle de l’image pourrait s’appeler comme ça). Si on a le droit d’écrire les chiffres au fur et à mesure (de dr. à g.) ça demande juste un peu d’entrainement. Dans les (vrais) exercices de calcul mental, il faut écrire les chiffres de g. à dr.
Haha oui là autant le faire direct avec les chiffres. Mais ce qui est intéressant c’est la méthode d’apprentissage visuelle.